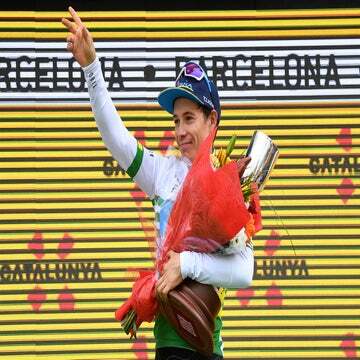 Overall leader Michael Albasini (GreenEdge) unleashed a long sprint to win stage 2 of the Volta Ciclista a Catalunya in Girona, Spain. 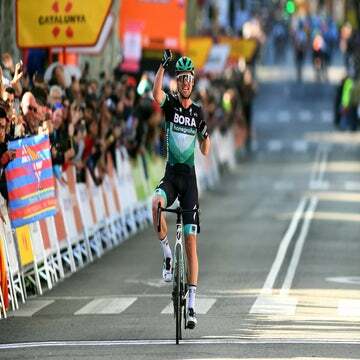 The Swiss rider topped Dario Cataldo (Omega Pharma-Quick Step) and Rigoberto Urán (Sky) to confirm his lead in the weeklong stage race. Damiano Cunego (Lampre-ISD), Daniel Martin (Garmin-Barracuda) and Matteo Carrara (Vacansoleil-DCM) escaped over the top of the Alt del Angels climb, 10km from the finish. The trio held off the chase until just inside the final 3km. Bradley Wiggins led out the sprint for Urán, but Albasini spoiled the Sky plan when he jumped up the left side of the rode and held off a late-charing Cataldo. Alejandro Valverde suffered a mechanical on the final climb and lost over two minutes to Albasini, dragging a group of approximately 40 riders to the line.